The Siddhi Vinayak Resort’s 24-hour, state-of-the-art Business Centre has been designed keeping in perspective the business traveller and his office needs. The hotel endeavors to provide seamless business facilities that make a guest feel like he is in the familiar environs of his own office. 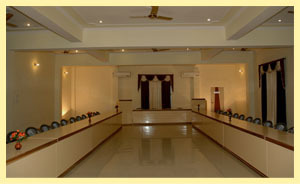 With capacity of 200 people hall is centrally air conditioned and has facilities for presentations and meetings like projector, sound system, buffet. Ample parking is available.